A powerful, surreal novel, in the tradition of Gogol, about the chaotic events surrounding the arrival of a circus in a small Hungarian town. 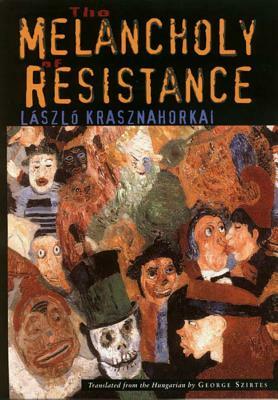 The Melancholy of Resistance, Laszlo Krasznahorkai's magisterial, surreal novel, depicts a chain of mysterious events in a small Hungarian town. A circus, promising to display the stuffed body of the largest whale in the world, arrives in the dead of winter, prompting bizarre rumors. Word spreads that the circus folk have a sinister purpose in mind, and the frightened citizens cling to any manifestation of order they can find music, cosmology, fascism. The novel's characters are unforgettable: the evil Mrs. Eszter, plotting her takeover of the town; her weakling husband; and Valuska, our hapless hero with his head in the clouds, who is the tender center of the book, the only pure and noble soul to be found. Compact, powerful and intense, The Melancholy of Resistance, as its enormously gifted translator George Szirtes puts it, "is a slow lava flow of narrative, a vast black river of type." And yet, miraculously, the novel, in the words of The Guardian, "lifts the reader along in lunar leaps and bounds.